Carles Bo was born in El Vendrell (Baix Penedès) in 1963. He graduated in Chemistry in 1986 at the University of Barcelona, and obtained a M.Sc. degree in 1988 for studies on homogeneous catalysis. He continued research focusing on computational chemistry and obtained his Ph.D. degree in 1992 under the supervision of Prof. J. M. Poblet. The thesis dealt with the topological analysis of the electronic charge density function in transition metal compounds. During his thesis studies he visited the Laboratoire de Chimie Quantique (Strasbourg, France) several times and carried out research work under the guidance of Profs. Dedieu and Bénard, and later he spent a short post-doctoral stay at Prof. Baerends’ group in Amsterdam. Prof. Bo holds an Assistant Professor position in Physical Chemistry at the University Rovira i Virgili (Tarragona) since 1995. 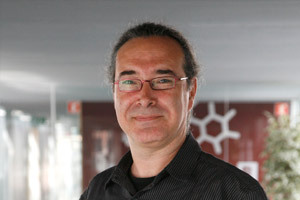 His research activities focus on the application of computational methods to study systems that contain transition metal atoms, paying special attention to solving chemical problems in close collaboration with experimentalists. Reseach topics include a variety of transition metal complexes, metalocarbohedrens, metalofullerenes and polioxometalates. Lately, he has been doing research on the structure and reactivity of organometallic compounds, and on homogeneous catalysis reaction mechanisms (CO2 fixation, organo-catalysis) pursuing a better understanding of the effects induced by the catalysts and ligands, and of the role of steric and electronic interactions. Prof. Bo develops computer codes and is co-author of Xaim, a program to analyze charge density functions, and of ADF, the Amsterdam Density Functional package. Recently, he has led the development of a new Web interface, www.iochem-bd.org, designed to manage computational chemistry results and to facilitate research and data mining.